Sunshine the corpse flower was in full, gorgeous bloom in August 2017. 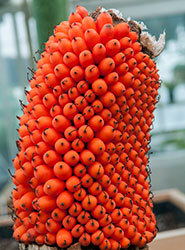 Sunshine was our first titan arum to be displayed outside, in the Sensory Garden. 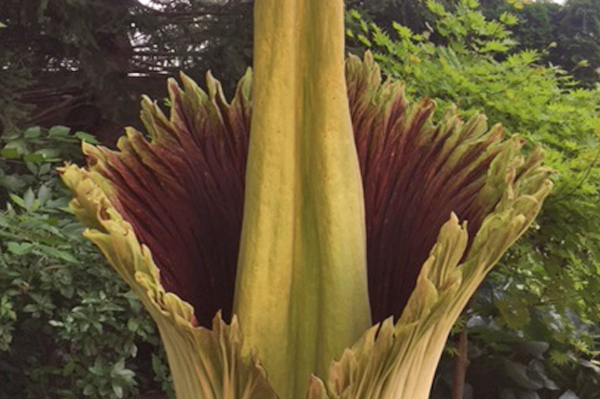 The corpse flower, or titan arum (Amorphophallus titanum), is an unpredictable plant that can grow 6 to 8 feet tall and unleash a rotten stench to attract pollinators. Infrared photography is used to monitor the bloom to estimate the best time to pollinate. Haven't you had other titan arums bloom? Yes; we've been lucky. 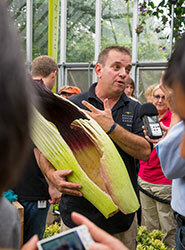 The Garden began collecting titan arums in 2003, as part of a worldwide conservation effort to preserve the species. Many of our titans were acquired at the same time, which is why the Garden has had several ready to bloom in a short time period. 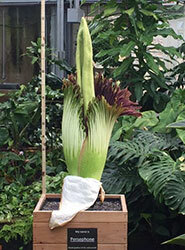 But whether a titan arum blooms, or when, is always an open question. Why did you move Sunshine outside? 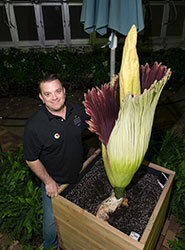 We wanted to display the corpse flower in a more natural setting; our other titan arums were displayed in a greenhouse. A native of the equatorial rainforests on the island of Sumatra, the corpse flower thrives in heat, humidity, and shade. Our scientists and horticulturists tracked Sunshine’s growth and development in the fresh air, Chicago’s unpredictable summer weather, and yep, its namesake, sunshine. Java and Sumatra bloomed in succession on May 30 and June 1, 2017.